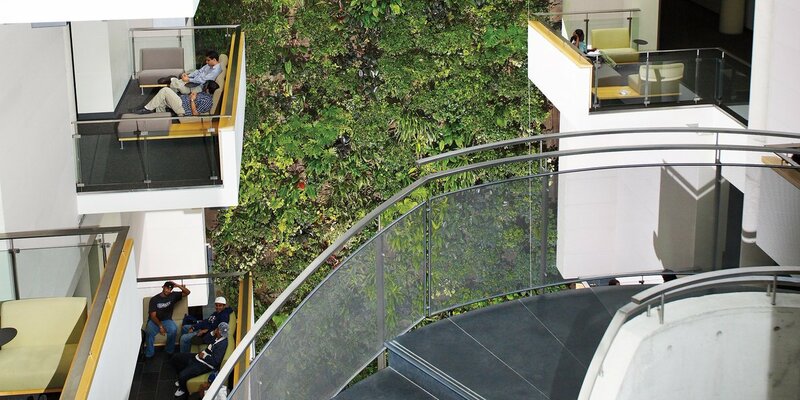 This five-storey living wall biofilter is the located in the atrium of the Papadakis Integrated Sciences Building (PISB) at Drexel University in Philadelphia. The wall is one of North America’s largest living biofilters and won the Interior Green Wall Award of Excellence, 2013 CitiesAlive Conference. The 6.7m wide and 24.3m high biofilter assisted the PISB in earning Gold LEED-certification. The wall also earned Parker Urban Greenscapes (a division of Parker Interior Plantscape, Inc) two awards at the PIA Interior Plantscape Hall of Fame and Awards Banquet at the 2012 Industry Expo.